So, you’re thinking of opening your own restaurant and getting involved in the hospitality industry? Investing proper time and attention to the design phase of your restaurant or cafe is a vital component necessary for success in such a competitive industry. A well-planned professional kitchen is at the heart of a successful hospitality operation. Granted, we might be slightly biased! As you’re developing the look, feel, and efficiency of your commercial kitchen, design changes are common. Ideally, you’d catch the unwanted design errors before installation. Why use the Kitchen Design Tool? Design chaos can be avoided; however, preparation is key. 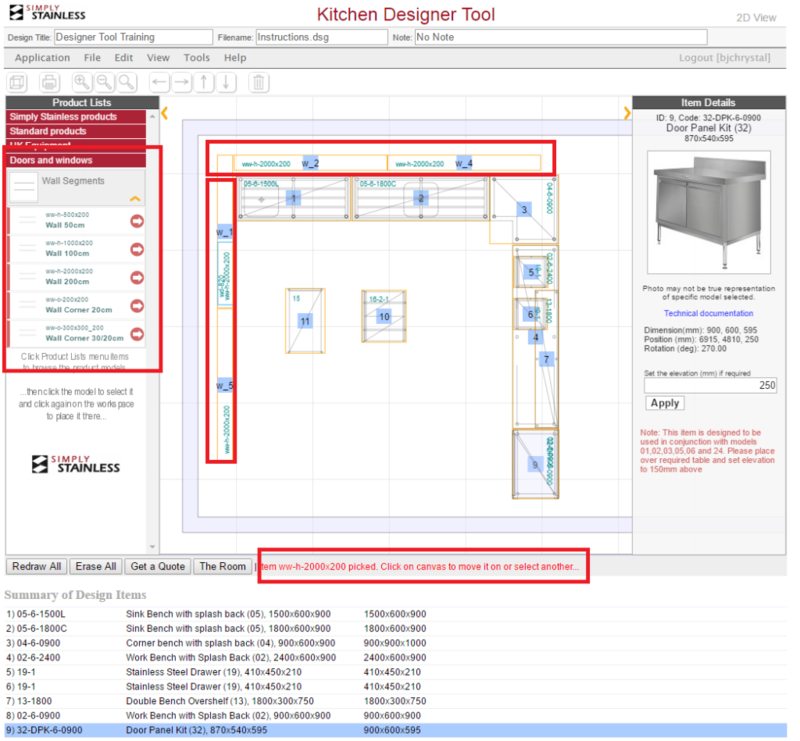 Our free kitchen design software simplifies the process of designing your commercial kitchen. 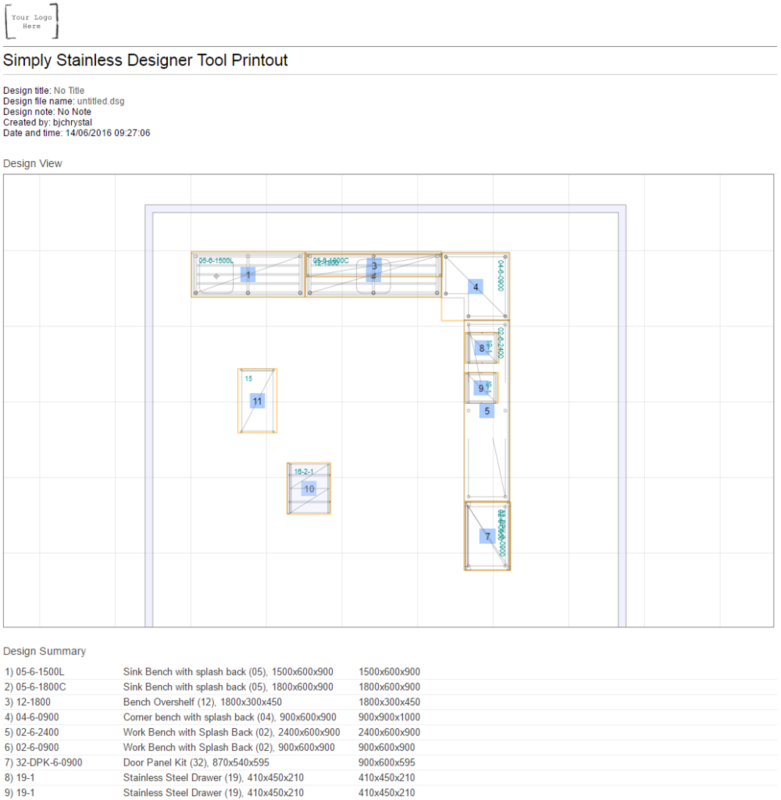 It allows you to build a virtual design utilising the modular Simply Stainless system, so you’re as prepared as possible for any unexpected issues in your project. 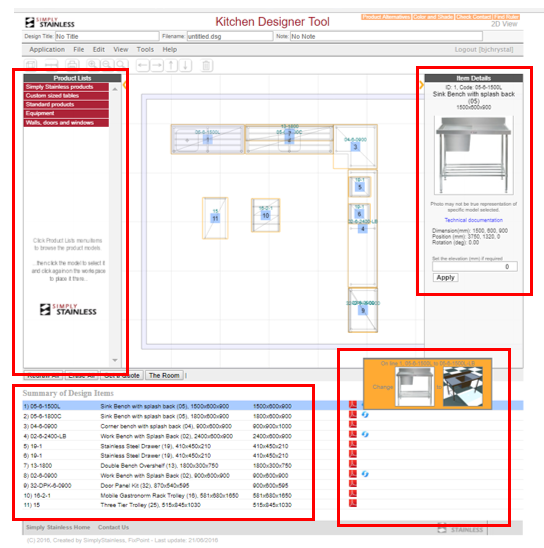 To put it simply, our online kitchen design tool will make your planning process stress-free. 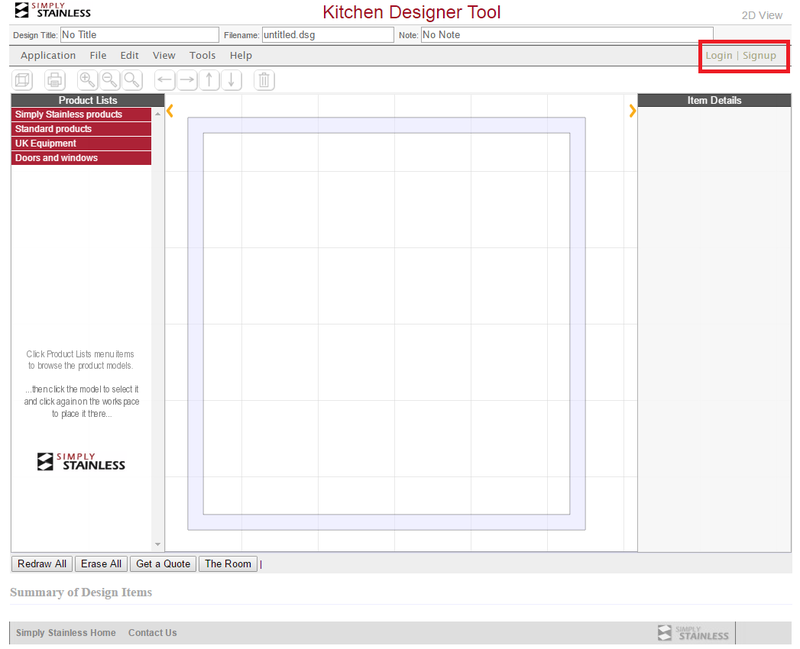 Use your smartphone, tablet or computer to access our Kitchen Designer tool – we’re compatible across all devices (refer to our Quick Tips at the end of our guide for more information). 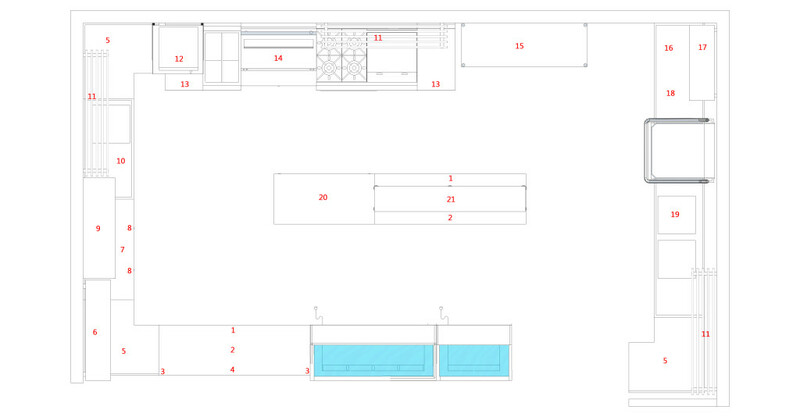 Design your own kitchen layout by following our easy 12-step user guide to designing the best commercial kitchen. Create a Kitchen Designer Tool login using a username and password of your choice. 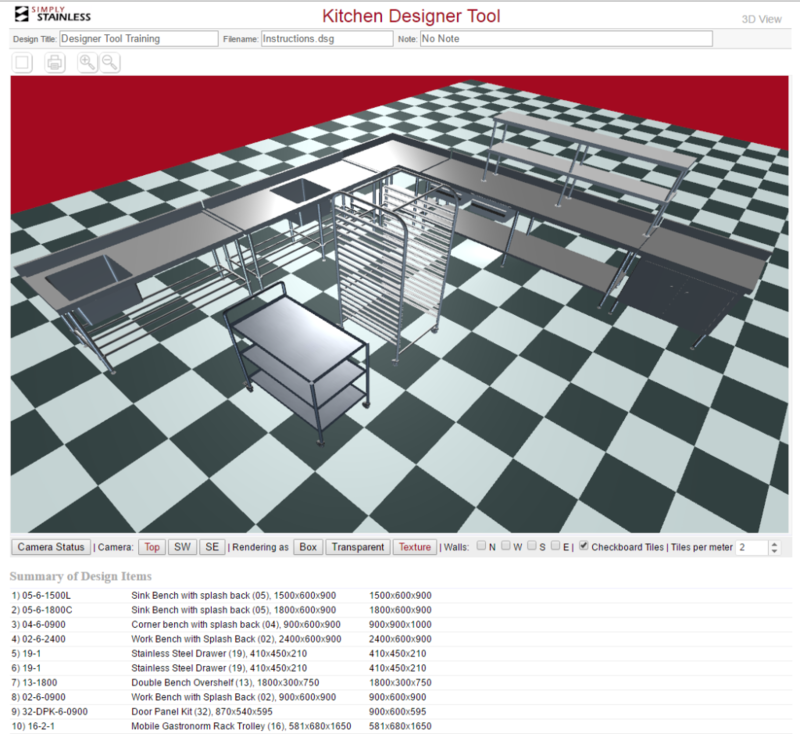 This online login gives you complete access to all of our kitchen design software – to save designs, request quotes, generate 3D concept views, download and print your designs as needed, etc. With your account, you will always have access to your saved design at any point in time. In the top toolbar, set your Design Title in the input field. Allocate a Filename and any short project Notes here. Item Details will display helpful hints when no item is selected. Each click presents a new hint. Image icons in the toolbar facilitate movement around the canvas. You can also load doors and windows into your design so long as they are being placed on existing walls you’ve placed on the canvas. Pick the product list you would like to access, select your category of choice, and then choose your equipment. Click where you would like the selected equipment on the canvas and it will migrate across automatically. The Item Details bar on the right-hand panel displays the following critical information on your selected. This panel allows you to adjust the height of the unit. All items specific to the selected unit will default to a predetermined height (e.g. 670mm for 19-100 drawer system). 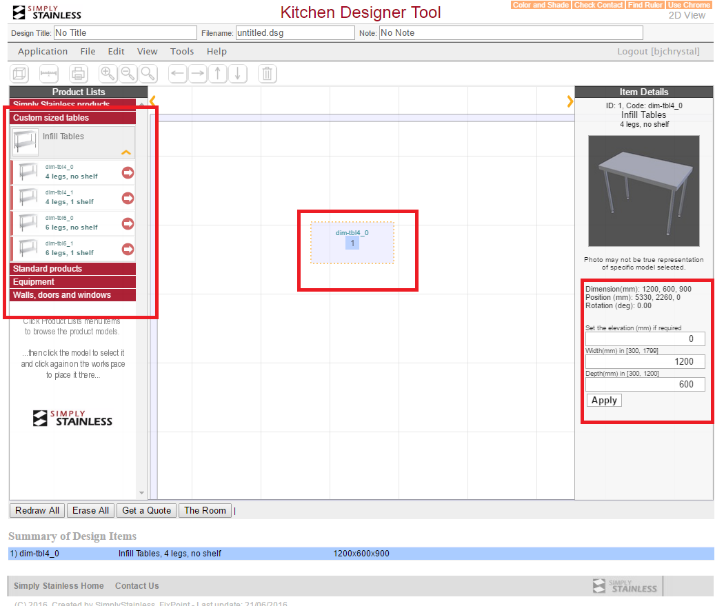 The Summary of Design Items lower panel displays a live table of all items placed on the canvas. For quick reference, each item on the canvas has a corresponding number to the unit listed in the summary. PDF icons adjacent to the corresponding numbers give you access to the specification sheet of the selected item. To change your standard undershelf to a leg brace, hover over the Blue Arrows with your mouse and click on the image that appears referencing Change. Follow the process below to place equipment on the canvas and adjust sizing to suit your design. If you select custom equipment from the Product Lists toolbar, the equipment will render as a standard box based on your nominated size. Customise the size of your equipment by selecting “Custom Sized” from the drop-down menu once your equipment has been selected from the left-hand toolbar. 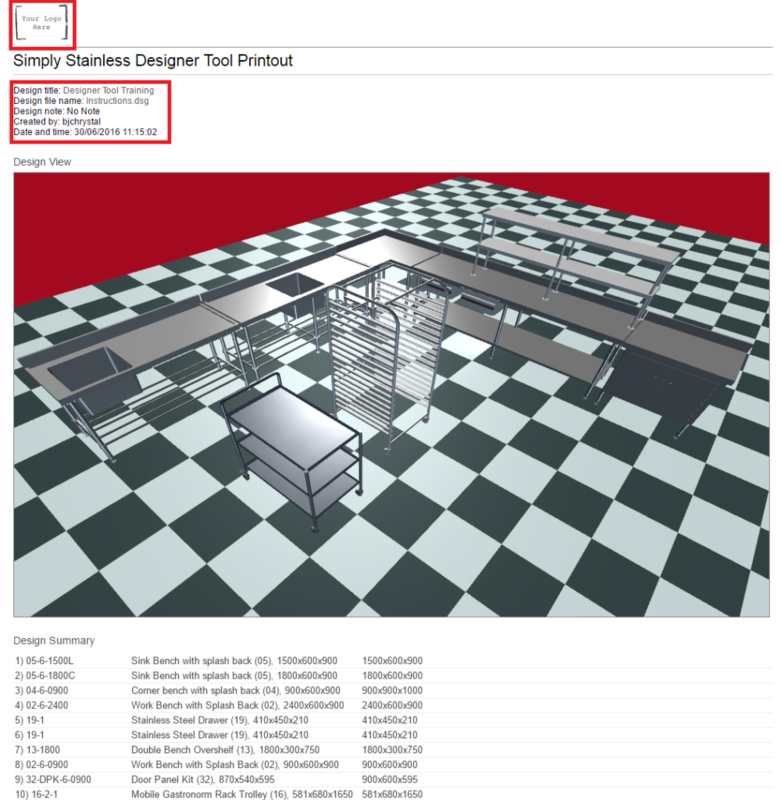 You can also customise the dimensions via the right-hand toolbar in the same manner as modifying the equipment dimensions. To Rotate items, continually click either side of the product to achieve rotation in your desired direction. To Move equipment, select product, hold to drag and release hold of the mouse to place product in the desired position. 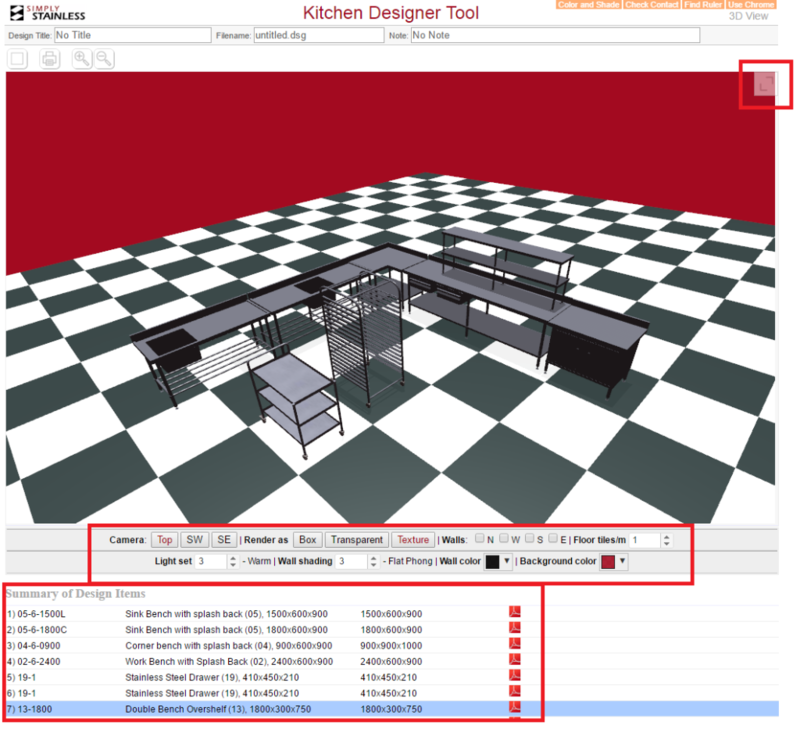 Equipment positions can only be modified in the 2D view, not in 3D view. 1. Selecting the Doors and windows category from the left-hand column and then your wall segment of choice to place on the canvas. 2. Any walls you put on the canvas yourself will remain as a transparent fixture unless they are removed/modified via the 2D view. Default walls can be removed only via the 3D views. 3. Doors and windows (which default to a height of 950mm AFL) must be placed over the top of a wall segment on your canvas. 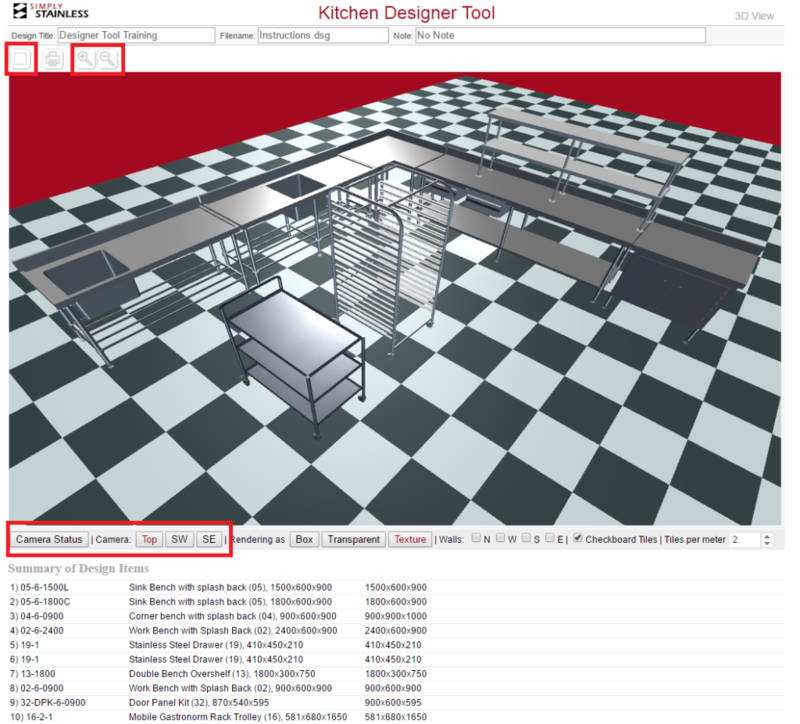 Select the 3D toggle box in the upper left-hand corner or via the 3D View tab on the toolbar once your design is ready. Allow the screen a few seconds to load and display your 3D render. To view the canvas in Full-Screen Mode within this 3D display, select the icon in the upper right-hand corner of the canvas to expand the image. Use any one of these methods to adjust the camera position while in the 3D view. Right-click your mouse to hold the screen and move the camera angle and left click to adjust camera position. Use the mouse’s scroll function to zoom in and out of the canvas. Select the Camera icon to revert to top default view. The top left toolbar will take you back to the 2D view for editing, and the magnifying glass icons work in the same way as your middle mouse scroll. See step 5 for more information on the Summary of Design Items. The Print Icon at the top left corner of your canvas (adjacent to the 3D view icon) will open a new window for the 2D and 3D view as seen below. It will show the last view your camera was set at. Once the print screen window is open in a new tab, you can input your uploaded company logo and other important file information (date/time, file name, title etc.) in the top left-hand corner of the canvas. Be sure to enable browser pop-ups. This option is available as long as you are logged in with a valid email address. The Email option will automatically send the pdf drawing and schedule of equipment in an attachment to yourself for you to then forward to your client. In the lower toolbar, click the ‘Get a Quote’ An email will be sent automatically to Simply Stainless head office who will then forward your request onto your closet distributor so they can reach out to you directly. Compared to the entire design process, this is actually the easiest step! Purchase the necessary Simply Stainless product to make your design come to life. Join our community of happy and satisfied customers and enjoy our lifetime warranty while you’re at it. Love reading but prefer a video tutorial to take you through our 12-Step User Guide? Access our video here. There are a couple of things to note before you get started. The Tablet doesn’t offer all usual functions so you’ll need to amend the way you select items to place on the canvas. Contact us at info@simplystainless.com and we’ll get you sorted!